In many industries and buildings, access to the roof is something that has not been adequately considered until it is required to perform maintenance or to install fire protection systems such as vents, skylights for lighting or chimneys. If it is taken into consideration when the project is designed, this kind of access does not have a high economic cost and its installation is very simple for any kind of cover. – Proroof ST model: designed for people access and also goods or large volume packages. Both models are designed for simple and safe access to deck with an open position locking system, pneumatic cylinders to ensure progressive opening and closing and a crank with a key to prevent the access to the deck or the entry from there to other non authorized areas. The maximum measures are 750×3300 mm. for the Proroof ST model and 1400×1400 mm. for the Proroof LD model, but it can be also manufactured for smaller sizes. 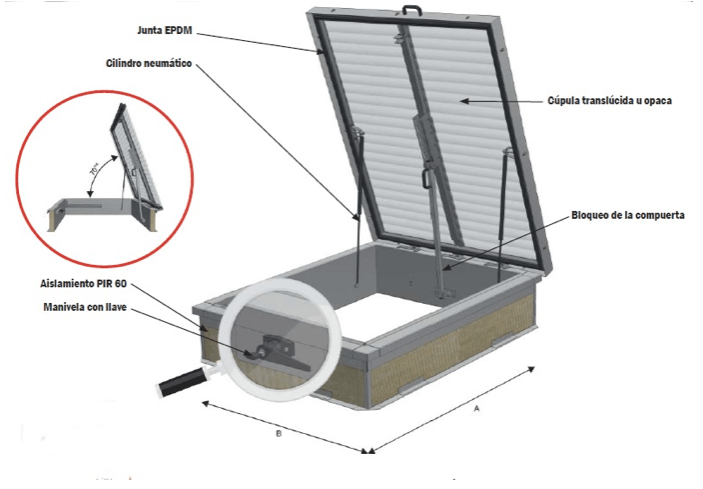 Both systems are tested against impacts of soft bodies, for 1,500 Pa of external overload and 1.000 Pa of internal overload and they can allow lighting thanks to its polycarbonate domes or opaques if they are made with aluminium.